Arran and Alison Bevis’s relationship with beautiful Belize is a tropical fairytale all of its own. Arran’s Father, Jim, was brought to Belize in the 1960’s by his father, who pioneered farming rice in Belize, and was raised in the Belizean jungle. Jim is a renowned adventurer, while his wife, Marguerite, is a Registered Nurse and the “go to” authority on any number of jungle maladies. In 1989, Jim and Marguerite developed Mountain Equestrian Trails in the Cayo District, nestled in the foot of the Maya Mountains near San Ignacio, where Arran grew up: he’s now an accomplished horseman, a guide with extensive training in swift water, cave and jungle rescue, and a father himself. 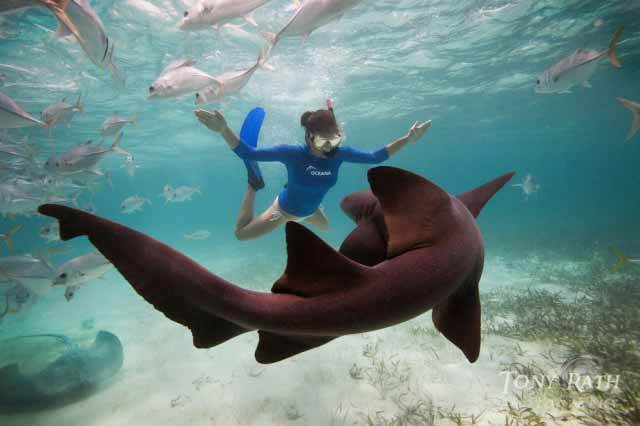 What are your top Belizian picks for adventure-seeking families? I’ve had fun exploring both these Mayan ruins with my children; they are captivated by the ancient remains and I’ve even climbed the ruins with my baby in a sling, so it’s entirely possible to do. You can spot monkeys from time to time at Xunantunich, along with iguanas down by the river. It doesn’t take long to get to either of them, compared to the massive, amazing ruins at Tikal (see below) or Caracol, so you have time to stop in San Ignacio town and enjoy some gelato too! I can take any of my kiddos here: both of these places are easily accessible with small children. 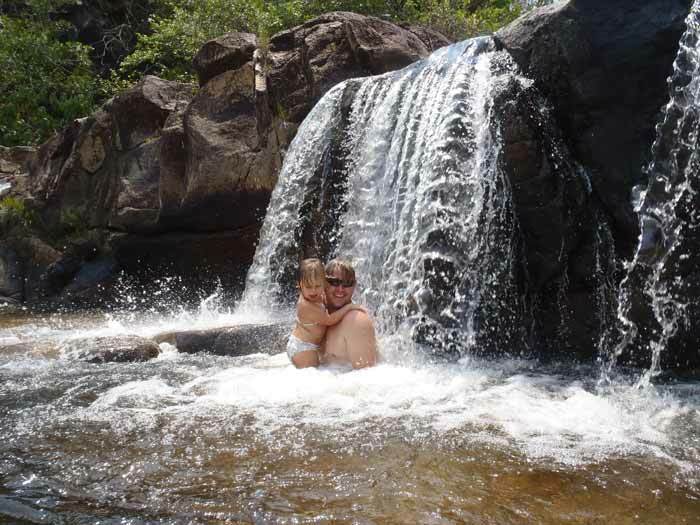 At Rio On, there’s a variety of depths of water and many natural pools to choose from, so it’s great for swimming with the kids and sliding down the waterfalls. The enormous Rio Frio Cave, with its huge, impressive entrance, is also a great attraction for all ages, perfect for some spooky exploration, and easy to get in-and-out-of. One of my favorite spots to spend a little R& R with the family on the beach is Placencia. 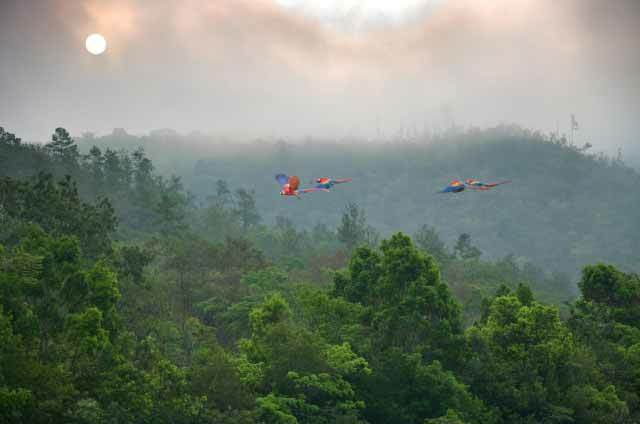 It’s a beautiful drive to get here, down the Hummingbird Highway, and it’s useful to have car to get everyone around. There are beautiful beaches and loads of islands surrounding which are amazing to sail around, on calm Caribbean seas. 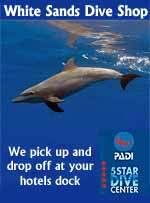 I’ve seen dolphins swimming around the boat, and if you’re there in the right season (April-May) you can see the whale sharks and swim with them too. Tip: Tutti Frutti has the best gelato in Placencia, owned by Italians. An awesome, scenic day out for all ages on Vaca Lake: La Capitana and his crew are very helpful with the kids, and I’ve taken my baby on this one too. Some of the sights and waterfalls are a hike from the boat, but are short enough distances for a 5-year-old to walk. If not, the crew are always willing to carry a child or two! There are some sweet natural pools, easy to access with the baby and kids, and I’ve seen both monkeys and kinkajous on this trip. I’m not even sure if I’ve even seen all the spots on offer…it’s always a pleasantly surprising experience. A developed, tourist-oriented island, perfect for relaxing with the little ones. The main town of San Pedro has lots of little luxury bolt-holes and amazing dining – and the boat-ride to get there from Belize City is fun for kids too. An easy-access cave adventure for all ages: you enjoy a canoe ride into this cave, to explore the ancient Mayan underworld within! Plan a trip here for either your arrival or departure day. It is wonderful little zoo located between Belize City and Belmopan (Belize’s capital), with whimsical signs and child-oriented messages about conserving wildlife. It’s home to jaguars and other large cats, tapirs, Scarlet Macaws and even the Harpy Eagle, among lots of smaller creatures. Cheers Restaurant is close to the zoo for a burger, and fries, or a plate of delicious rice and beans and stewed chicken. 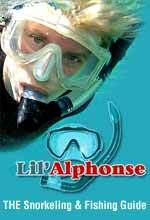 After that, Jaguar Paw is just up the road and is a great place to stop in and do some cave tubing and zip lining. We might be biased, but our rides are the best Belize has to offer! A half-day horseback tour to La Vega – a lush jungle valley with a meandering creek – is a fabulous option for younger kids. 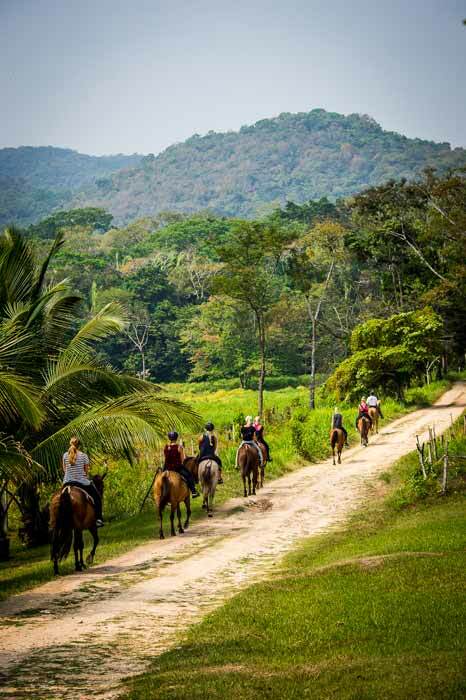 It’s possible to ride with little ones on your horse and take it slow, and jungle horseback riding is something you (and they) will remember for the rest of your life! A ride to Big Rock Waterfall is a little more challenging, as you have to conquer a short, steep hill to and from the waterfall. Younger children will need floaties here, but you won’t be sorry for your effort, and there are big rocks for jumping into beautiful swimming pools. 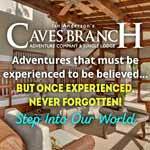 A third choice is a full day horseback tour to Barton Creek Cave (see above) for the adults and children old enough to ride. Children too small to ride can be watched by capable caregivers, and driven to meet you at the river cave for family exploration by canoe. 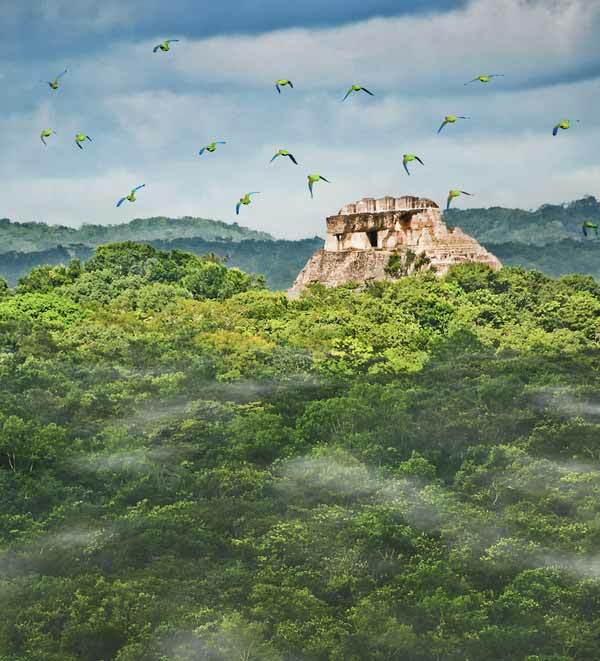 A trip across the border to Tikal in Guatemala, to see the immense, magnificent (UNESCO-rated) Mayan ruins and the abundance of wildlife to be found there, is a fabulous addition to a Belize trip, and is quite an easy – but adventurous – undertaking with little ones. What are your favorite hidden or off-the-beaten-track Belize treasures, the things that families might usually miss out on? Alison: Sapodilla Falls in the Cayo District. It’s definitely off the beaten path and requires some hiking, but you’re rewarded by a lovely set of waterfalls and swimming holes in a secluded and wild setting. The swimming is wonderful, but camping out and spending the night there is even better with the family! Arran: The Macal River winds down from the Caracol hills and offers great canoeing for all ages! There’s a great half-day trip that can lead you down river to the Mayan ruins of Cahal Pech (see above), near the town of San Ignacio. 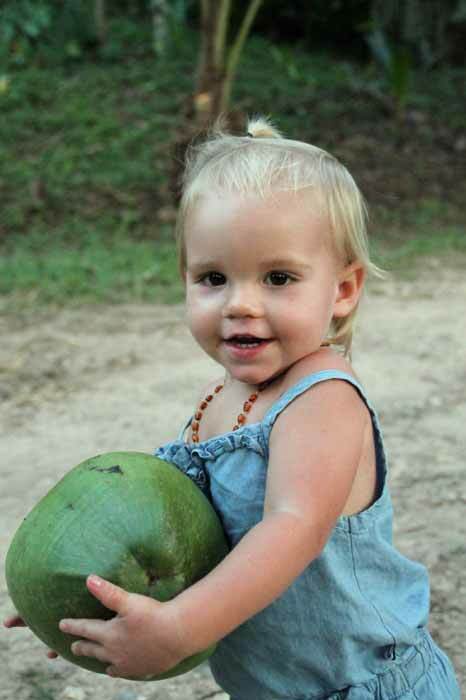 What do you love most about Belize as a place to spend time with your children? I love that we are outside all the time, surrounded by sheets of green and close to nature: the girls love to help me garden, where birds abound, butterflies flutter, monkeys howl and crickets chirp. 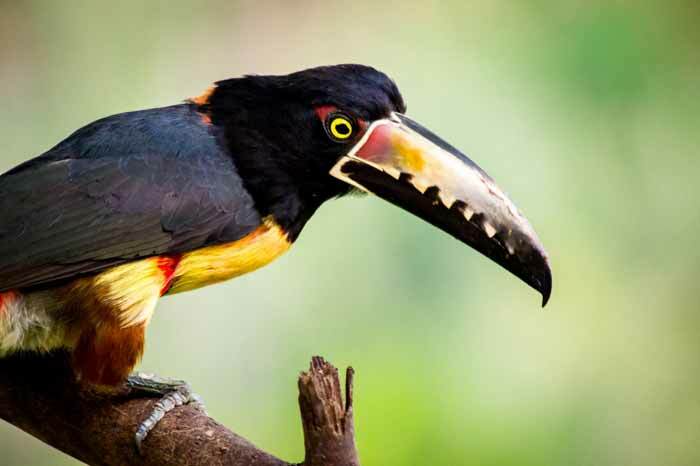 We see toucans almost every morning, Sierra and Savannah bring me bouquets of flowers every day, and we still get excited when we sight a cool animal in the neighborhood. There are waterfalls close by, and the beach is just a few hours away. There’s opportunity for an adventure daily! 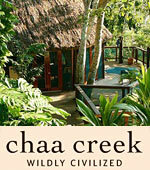 Away from home, what are your favourite places to stay in Belize? In the San Ignacio area, I’d recommend the San Ignacio Resort Hotel. It is a great place for the kids, features a swimming pool, and the great, educational Iguana Project that our kids love. The Parrot Nest Lodge along the Mopan River is great for a slimmer budget (though it’s tree-houses, so better for older kids); there you can spot agoutis and kingfishers, along with lots of beautiful birds. On Ambergris Caye, El Pescador is my favorite. I’d also highly recommend Ramon’s Village. In Placencia, I’d choose Robert’s Grove for a more resort-ish experience, and The Cozy Corner – which has a great little beachside restaurant - in the village itself. Both have great beaches. If you happen to be in the Dangriga area south of Placencia, I really enjoyed my stay at The Pelican Beach. 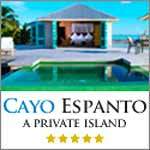 They also have another resort on the small private island of South Water Caye that I am dying to see, because I hear it’s very beautiful. 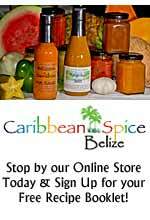 What Belizean food (and drinks) are your family’s favorites? Marta and Blanca who cook for us here at MET make THE best Rice-and-Beans and Stew Chicken in the Country! Rice-and-Beans and Stew Chicken together comprises Belize’s most traditional meal: they rub and stew the chicken in recado rojo (red achiote paste) with chopped onions, sweet pepper and spices. It’s served with rice-and-beans, coleslaw, and fried plantains. In town (that’s what we call San Ignacio), there’s a little local place called Mincho’s, where you’ll find cheap, delicious Belizean fast food consisting of homemade papusas, salbutes, tacos, and more. They always have a wonderful selection of fresh squeezed juices: tamarind, soursop, coconut water, watermelon, orange juice, which the children love. We also love to go to Mr. Greedy’s Pizza: as well as the (non-Belizian) pizza, they have great local coconut shrimp. The adults can enjoy a fabulous margarita, while the staff make fun non-alcoholic frozen drinks for the kids, with ice cream and a cherry on top. 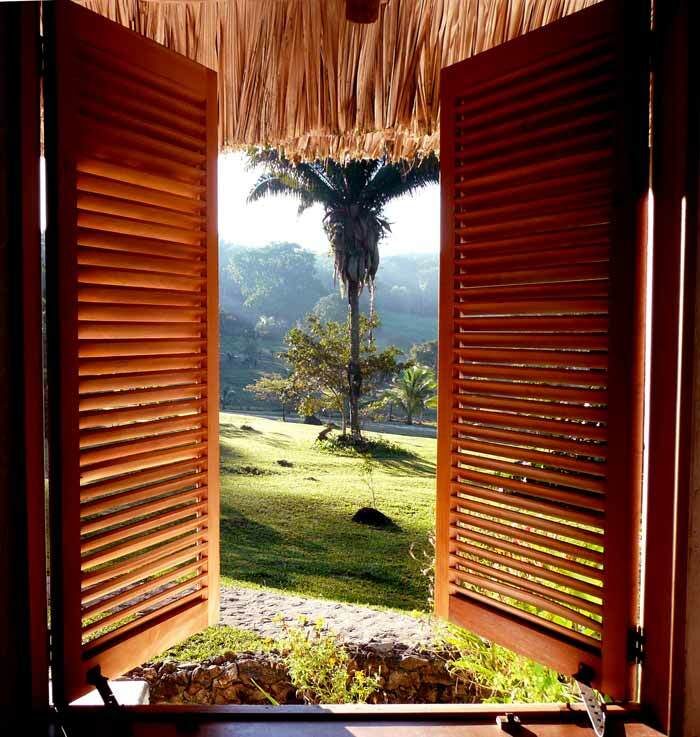 What would you recommend travelers to Belize to bring – and what should they leave behind? Bring a head-lamp and leave the high heels at home! It’s best to dress in layers, so bring tank tops, and long sleeve shirts or sweaters for everyone to layer on, and if you’re going riding you’ll need long pants with closed-toe shoes (hiking boots or sneakers will do fine). Don’t forget your swimsuits, and bring water-shoes for the little ones if going barefoot in rivers isn’t appealing to them. Leave behind your job and your worries….you can always check in as internet is now available country-wide. What time of year would you recommend for the perfect visit? February: it’s beautiful and not usually busy. 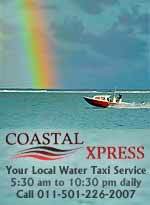 The summer months (June to August) are also great for families, but be prepared for occasional rain showers. The best part about summer travel, however, is that wonderful fruits and vegetables like mangoes, avocados and breadfruit are all readily available. 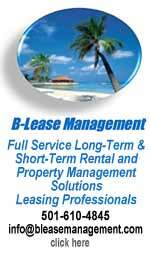 What would you suggest families avoid in Belize? Avoid getting off the beaten path in Belize City, and discourage people from following you around, claiming to be tour guides. Only go with tour guides recommended by your hotel. Arran, growing up in Belize, what are your favourite memories of being a child here? Some of my fondest memories are of jumping on my horse and heading off with my dog to explore the many caves and waterfalls in our area. The Mayan guides that worked for my father at the time were full of knowledge about the traditional medicine of my jungle, and gave me the confidence and ability to explore the deep, uncharted regions of the country. In a place where 60% of the land was tropical broad-leaf forest, it truly was a paradise for a young explorer. And Ali, what do you think your children’s best memories of childhood here will be? I think they’ll remember playing chase in the jungle, climbing the guava tree, searching for chicken eggs, and meeting interesting guests. They’ll recall learning about the plants, birds, and wildlife of the jungle, as well as planting with Momma, playing and learning from Mamarite and Papa (Grandma and Grandpa), taking horseback rides with Daddy and sometimes Momma too, camping on the river, and sharing their world with foxes, snakes, iguanas, tarantulas, monkeys and tapirs. What makes Mountain Equestrian Trails a great place for travelers to bring children? Kids love horses, waterfalls, rivers, and the natural world. Children become fascinated with the lizards, frogs, insects, and hummingbirds we have resident, and it’s a great place to exercise their imaginations. They enjoy playing games in the evenings and the camaraderie of people hanging out together in the Cantina. Many children tell their parents they don’t want to leave, not even to go to the beach. And finally, you have a lovely babysitter for the evening. What does your perfect date night consist of in San Ignacio? 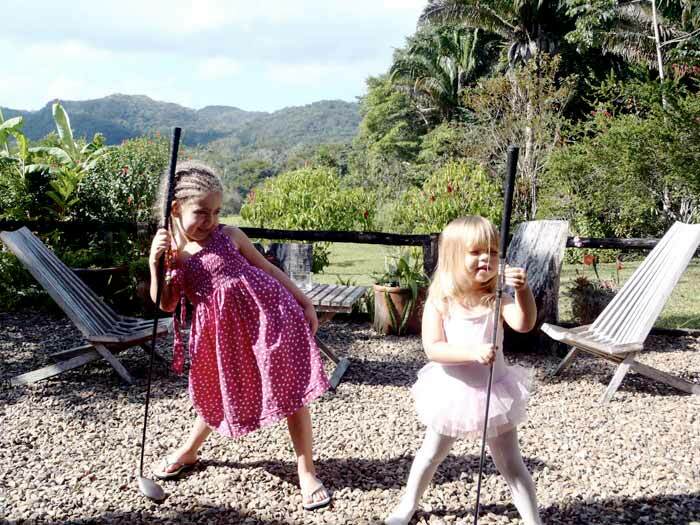 We might go out to eat dinner at the Barn & Grill Steakhouse, Hannah’s or Erva’s Restaurant and then to the San Ignacio Resort Hotel for some dancing, and if they don’t have any dancing there, just see where the night leads. There are frequent special events and opportunities to see live music, so there’s always something going on. This is a compilation of videos taken by Jason Lee during his trips to Belize. He traveled to various resorts such as Slickrock, Mystic River and Blackbird Resort. 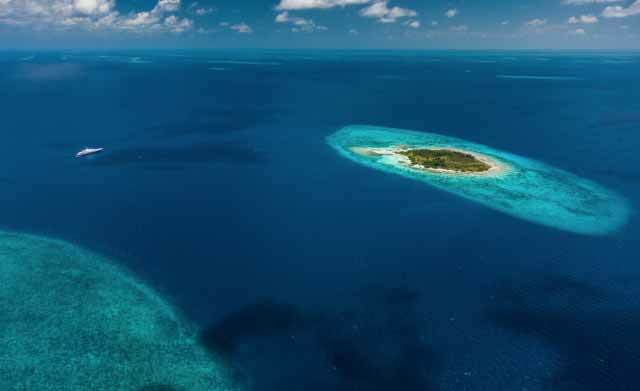 Slickrock Adventures is a private island resort located in Belize, 35 offshore on an atoll that is a Marine Reserve. Slickrock Adventures specialize in adventure sports such as sea kayaking, paddleboarding, windsurfing, kiteboarding and much more. Mystic River Resort jungle lodge, located in the jungle of Belize, 7 miles from the twin towns of San Ignacio and Santa Elena, is the best place to find the perfect something – or nothing – to do. 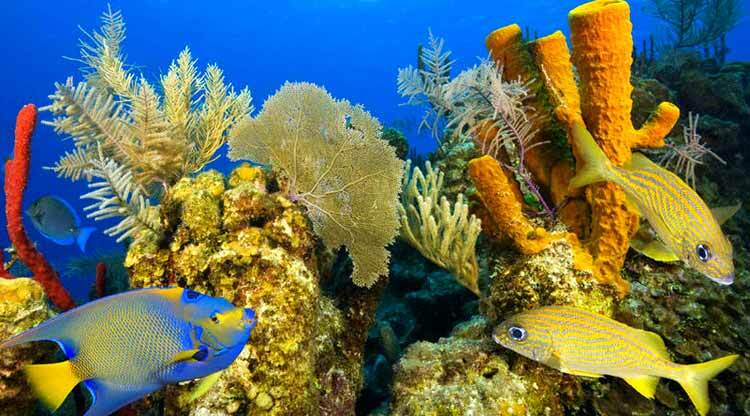 Blackbird Caye Resort is located on the Turneffe Atoll, 25 miles off the coast of Belize City, Blackbird Caye Resort is nestled within a 2-mile long private, white sandy beach. 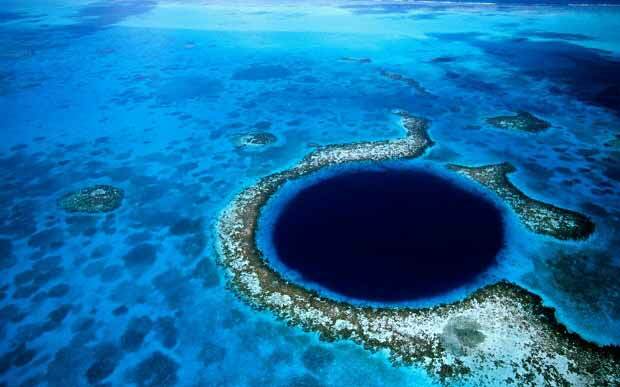 Another Shade of blue-Belize from Big Media on Vimeo. The large croc jump was filmed by Tamara of the San Pedro Sun. Crocodile rescues, shark feeding and 'Chicken Bingo' are just a few of the adventures that we find Ty experiencing in the adventure-laden country of Belize on Another Shade of Blue with Ty Sawyer. From ancient Maya pyramids to forbidding Maya caves where Ty discovers sites where secret bloodletting rituals took place, Belize is a country crammed with experiences. The Maya lived in Belize for thousands of years and their culture and heritage is reflected in centuries old ruins such as Xunantunich, where Ty photographs the dizzying vistas from high atop the pyramid of El Castillo, once the private platform of Maya kings. Ty flies to an island off the coast of Belize, Ambergris Caye, and he meet's a couple devoted to saving the nearly extinct species of the American Crocodile. All in a day's work for Ty Sawyer. Trailer To Belize Video from Tony Rath on Vimeo. 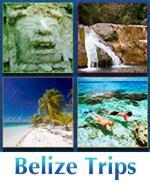 Visit Belize v 1.2 from skycamguatemala on Vimeo. 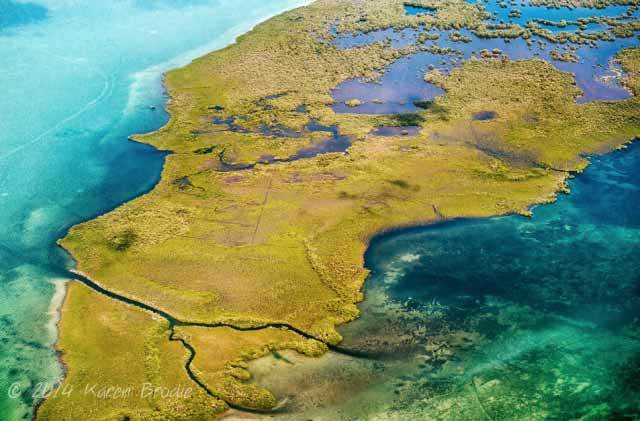 10 Days in Belize: 5 Days in San Ignacio and 5 Days on Caye Caulker. Belize Latest Cut from John Christie on Vimeo. Grab your Belkin beer and get ready to tickle the sharks. It's time for another tropical island adventure. Countdown of the 10 best places to visit in North America. This is a companion piece to Discovery Channels big "North America" series of blue-chip natural history. When they came up short of their contracted 6 shows, this one was hastily imagined to fill out the series. I was producer, writer, editor, and my task was to make up a countdown show that would use footage from the series coupled with whatever I could find in Discovery Channels stock library. Also needed to match the series style of using pop hits as music videos within the show - but I was restricted to Discovery Channel's music library - no Rolling Stones.